This week my husband made an ironing table on casters for my quilting room and I love how it turned out! I came up with the design and Tim did the wood work. While I was at our retreat at Fabriculous last week I purchased the fabric and paint for the project. The fabric is Dashwood Studio’s Norrland fabric and the paint is Cobalt Blue Plaster Paint. I’m so happy I went bold with this project as I love this fabric, its so unique and the blue give it a wow factor. When I’m not using it I can just tuck it against the wall. Now to find some fun baskets for the shelves and I can use it for more storage. Feels good to see my studio coming together. I thought I would also share a few pictures of my neighbours horses as they made a daytime appearance. They were quite curious with what I was doing but didn’t mind me taking their picture! We had our first snowfall on Friday which made for a beautiful backdrop. This past weekend was our 4th Annual Highway 10 Designs Retreat at Fabriculous in Swan River, MB. This time the retreat was extra special as it meant I was able to visit with my friends from northern Manitoba which made the 10 hour drive worth it! Our hosts, Wendy and George, always provide us with a fun extra project for those that want to participate and this time it was making small barn quilts! I chose to make a very low volume start block in teal and white, and Genny was kind enough to show me how to age it with a dry brush technique that really gave my block life. All the blocks turned out amazing! I spent some extra time with Lori before and after the retreat so we could get more visiting time in and that was so nice! 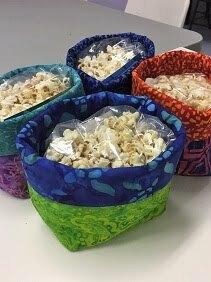 Before the retreat we were busy making fabric baskets that we filled with kettle corn for all the participants. And after we were working on new patterns. It was a very productive week! 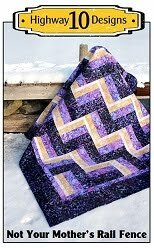 It is great to see all the different projects the ladies working on and there are usually a few working our patterns. 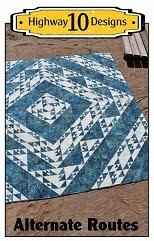 Phyl made a City Slicker and just finished quilting it on the longarm as Fabriculous is an APQS Rental location. Quite a few of the ladies were able to quilt their projects. Sheri was busy making a baby Quarter Sections quilt with really cute fabrics. I’m not usually a fan of Cotton and Steel but the bear print was sweet! I spent the weekend sewing a Pedal to the Metal with blue, brown and grey batiks from my stash. This is my son’s graduation quilt that I had delayed making because of the move. I just loaded it on the longarm today so hope to have it finished for him soon! I also made a few purchases and I’m very excited about this one. I’ll be sharing what I’m making with is soon! The weekend was a lot of fun and we even managed to get Wendy in our group picture. Love these next two pictures, they really capture the fun we have together. 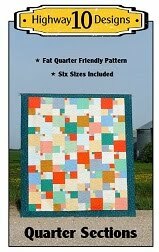 I gave my longarm a test run after setting it up and quilted my friend Phyl’s Quarter Section quilt. Glad to say my machine survived the move and I even improved it by turning my wheels over on my Millennium carriage as they were wearing down on the one side. Quick fix and no need to order new wheels just yet. Phyl used Northcott’s Oh Canada fabric line and inserted a extra row with panels and embroidery highlighting Canada’s 150th Birthday. I love seen how others adapt our patterns and put their personal touch on them. I quilted it with the Maple Syrup pantograph, Quilters Dream Blend Batting and beige So Fine thread. One thing I have notice about this area is that it is very windy so getting outdoor pictures is more of a challenge. Good thing I had helpers with me! As you can see Phyl used red Stonehenge for the backing! I went out for a drive around the neighbourhood and meet some of the neighbours! We set up our trail camera at the back of our lot and had a good laugh at what we captured the first day! This guy was quite interested in our camera and was taking a lot of selfies! We moved the camera back so he can’t keep licking it! Turns out there are two horses in the field behind our house but they only show up at 6:30 in the morning. Hope to get some daytime pictures soon. 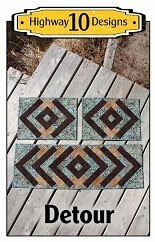 I’m very excited that our Highway 10 Designs retreat is coming up this Friday at Fabriculous in Swan River, MB and I get to see all my northern friends again who I miss very much! I spent an afternoon this week making the Poolside Tote. 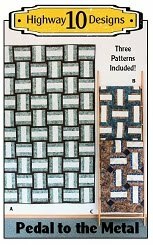 I had purchased the pattern and fabric last year at Fabriculous and thought it would be the perfect project to get back into sewing. The pattern is by Noodlehead and the fabrics are Lewis&Irene’s “Threaded with Love” and “Grandma’s Garden” which is the fabric with the tiny gnomes, so cute! I used Annie’s Soft and Stable instead of batting and it give the bag a lot of shape, very happy with that product. As I was taking these pictures along the back of our property I noticed there were two horses in the field out back. I hope to be able to get a few pictures of them when they wander down to our end. This week Tim made two batting holders for my batting rolls as I wanted them to stand vertical in the two corners in my room. I got the idea from Pinterest but the holders I saw were made with a 1x1 as a center post which was just held onto the base with one screw, not very sturdy. So Tim beefed it up using plumbing fixtures. They are made with 1 1/4” galvanized flange and a 18” x 1 1/4” threaded galvanized pipe so is very strong. Now no worries about it breaking off as I lift the batting on and off it. Tim also added four more pot lights to my sewing room so it is much brighter! I bought a folding table and added 12” PVC pipe to the legs for height, a trick I learnt from my guild in Flin Flon, and it makes a great temporary cutting table. I plan on getting lower kitchen cabinets for this nook which will be my cutting area and storage for my clients quilts. I’ve picked out a nice grey cabinet and hope to order that this week. This was the Thanksgiving long weekend here and my SIL and MIL came for a visit, our first visitors and it was nice to have family here for the holiday. We drove them around the area and enjoyed the fall colours, and found a lake or two that I hope to explore more of next year!